Hi all, I got a ringneck from someone who didn't want the parrot anymore. The parrot was kept in her cage from day one they got her from the pet shop. The 1st day I got her I opened her cage to let her out, she flew around and landed.I caught her with a towel and with no fighting I covered her head to calm her down then I clipped her wings and put her back in her cage but left it open so that she could get in and out. she is very wild the only time I pick her up is when she climbs of the cage and then I throw a towel over her and then pick her up and keep her very close to me then I give her a head scratch. She calms down but still wants to bite me she does not know how to put her feet over my finger. I so much want her to be like my other bird playful. She was also given just sunflower seeds to eat, my other bird eats fruit flavored pallets and I want her her to eat it as well so what I did I mixed the sunflower seeds and the fruit flavor pallets with water she now and then she grab a bite of the other bird's pallets but still wants sunflower seeds. please give advise to how to get her tamed.I feel so sad when my other bird sits on me and play with me then she just sits on top of her cage. I want her to come to me and also sit on me. Please help. Welcome to the forum, Sheila! Poor little thing! Thank goodness it ended up with you! Now, don't take this the wrong way but you might never achieve what you want with this bird. Let me explain. IRNs (all psittaculas, actually) are considered aviary birds and not companion. This means that even when they are handfed and properly socialized to people and handled right, once they reach the age of sexual activity, they will become aloof and prefer to be with other birds than with people. They simply do not bond as deeply as companion parrots and, in order for them to retain some of the original bond created by the imprinting to humans, handfeeding and proper socialization, they need to be handled expertly, regularly and very often or they revert to what people call 'wild ways'. This bird was never handled or socialized so it has reverted to the so-called 'wild ways' a long time ago. Can it be brought back? Yes, it can. But it will take a looooong time, a lot of work and many, many hours interacting the right way. But even if it's successful, it will not act like a companion parrot because you can't go against nature. Now, the first thing you need to do is to stop having any kind of expectation in terms of its behavior and just love it and enjoy what the bird is able to give you. This is mostly because parrots are individuals and they all react differently and in their own way to the same stimuli. The second thing you need to stop doing is toweling it and, MOST IMPORTANTLY!, stop forcing it to accept your touch. The towel and touching of its head when the bird obviously does not want it is called a 'flooding taming technique' and all flooding is a big no-no in the parrot world. It's something we used to do many years ago but we have learned since then that this is not conducive to a good long-term relationship with parrots. Basically, it ends up backfiring because you either break the bird's spirit or create a terrible despondency in the bird. I wouldn't have clipped its wings. For one thing, I don't believe in handicapping an animal but, for another, being able to fly means less stress both physical and emotional in a flying prey animal. Let the bird come out of its cage and go back into it on its own. If you time its breakfast and dinner properly, it will go back on its own but, at the beginning, I would only allow it to come out two hours prior serving its dinner (for which I recommend a good quality budgie seed mix). Of course, for this to work, you can't free-feed protein food but, as this is not recommended for any parrot, it's a healthy thing to do for all of them. Now, I am sure that this will surprise you but the fruit pellets are, by far, the worst pellets there are -they are full of artificial stuff, made out of very low quality ingredients and white sugar which is terribly unhealthy to parrots! 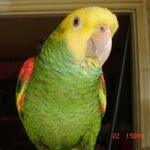 I would suggest you do a bit more research about the natural diet of parrots and, most especially, of IRNs because they require very little protein and fat, and very high moisture and fiber so pellets don't quite fulfill their dietary needs (too dry, too much protein, too little fiber). I recommend you feed it a nice gloop with more than 50% veggies in it accompanied by a large portion of raw fruit and a leafy green for breakfast and, as I mentioned before, a good quality budgie seed mix for dinner. I would also give it a multivitamin/mineral supplement (I would get the powder kind you mix in its water for now as you can't guarantee he will eat enough of his soft food for now) daily for two or three weeks (you need to replenish all the deficiencies caused by the bad diet it's had). If it were mine, this is what a normal day would be: uncover cage when the sky is beginning to get a bit or light in the horizon (5:30 am this time of the year), clean cage and feed gloop with produce. Turn overhead light in room about one hour after sunrise (about 7:30 to 8:00 am). Spend as many hours as I can in the same room he is, talking, whistling, etc but not staring at him or asking him for anything. In the evening, when the sun is halfway down to the horizon (about 5 pm), take food out of its cage and leave the door open. Again, spend these two hours interacting without touching it or staring at it. At around 7:00 pm, put his seed dinner in his cage and walk away but keep an eye on him (out of the corner of your eye) and, as soon as he goes back into its cage, close the door. Once he gets used to the routine, he will not mind this at all and, as he gets used to it and your presence, you can start training him to target which will help you with the step up and the physical interaction. BUT, he needs to learn that you are not going to trick him into anything he doesn't like first and this is going to take a longer time now because you are not starting from zero but a negative number because of the clipping, toweling and forcing him to accept your touch so, please, please, be patient and don't give up! Clipping a birds wings to tame it does not really work. It will seem to be dependent on you but is really more fearful. Let the wings grow back and he will be more secure and more willing to bond with you. I have birds that I have no expectations of them bonding with me. Sometimes they do anyway. I did not expect to have a relationship with Myrtle but without wings she depended on me to help her. When she made her first flight after her wings grew back it was to my shoulder. Before that she would climb me for help as long as my hands did not touch her. Most often it would be that she was testing her wings and she could not get back to her cage without my help. She would mostly fly to my shoulder to tell me secrets. It was a very long time before she trusted my touch. Thank you so much for your advise. yes I didn't want the bird to be trapped in her cage because my other bird I hand raised and I feel sad to see her just sitting in that cage while my other bird is enjoying himself outside his but I guest that's just the way things are at the moment. I do open her cage early in the morning she gets in and out on her own she does allow me to pass the cage without her getting scared. they do sleep with me in the bedroom, I cover her cage with a blanket but I leave the front door open for her, I take the blanket off in the mornings and move her cage to the kitchen while she sits on top op the cage for her to see the outside world, my other parrot does his own thing and also sits with her on her cage. I'm sure it will take a loooooong time for her to trust me completely. I can leave her wings to grow back but she will fly away that's why I clipped her wing but will leave it to grow back. can I start changing her diet? and how do i do it as she was only given sunflower seed to eat. she now and then will have a bite of my other birds fruity pallets and what if she does not want to eat that healthy food? do I put the food in her food bowl in the cage or can I put it on a separate plate inside or outside her cage?sorry for all the questions but I am a animal lover and get upset when I see animals are traumatise. You have an advantage that you have another parrot who wants to be her friend. Ignore her for a while and let your other parrot teach her. Myrtle did not know what foods were since she had been on a seed diet for her first year of life. She would not take anything new until Rainbow took it first. Now she wants anything that anyone is eating. She begs me for whatever I am eating even if the same thing is on her plate. Rainbow is now trying things like bananas that she would never eat before because Myrtle likes them. Rainbow always wants to pick up her food and bananas are too sticky to hold. Rainbow used to peel her grapes then eat them. Now she does what Myrtle does and scrapes the inside out. If you have a good relationship with your other parrot she will learn from her. Tommy loves to kiss and comes to me every time for kisses. Jackie wants to after watching Tommy. She will come so close that I can feel her breath. Others will come that close if they have cage wire between us. They do learn from each other. The more attention you give your other parrot, the more she will want your attention. I would start but switching her to a budgie mix instead of sunflower seeds - that should be pretty easy to do because she is used to seeds. Then I would make a nice gloop with more than 50% veggies BUT, at the beginning and in order for her to get used to eating it, I would start with just the whole grains and no veggies. Then, when I see that she is eating the grains (cook them very lightly so they are soft on the outside but still a bit hard in the inside and mix a little bit of the budgie mix into them), I would start adding the veggies gradually - first fresh corn, then baby peas, then diced carrots, then chopped broccoli, etc. These birds don't do well on pellets because they are primarily fruit eaters in the wild so the pellets are too dry, too low in fiber and too high in protein PLUS they have no phytonutrients whatsoever. Give her a dinner of a measured portion of the budgie seed mix and, once she is asleep, take the bowl out of the cage. In the morning, about one hour after sunrise, put the cooked grains with the little bit of seed mixed in in her cage and leave it there all day long even if she doesn't touch it (she won't at the beginning but that's OK because she is not going to starve as you will be giving her seeds for dinner). She should start eating it on the third day or so. Once she is eating her gloop with more than 50% veggies, start giving her raw produce about one hour before you give her the gloop. Try different presentations and always eat them yourself as well as feed your other parrot the same produce in front of her so she can see that you and the other parrot eat it -parrots learn from other parrots. But I urge you to change the pellets you are feeding! Thank you so much Liz and Pajarita for all your advise. I will start from the beginning and follow all your instructions. Another question (sorry for all the questions) but I want to give Tiekie everything of the best as I am doing with Kiko. They both have a normal size cage I put her cage a little higher then his cage, she also goes into his cage to take a nap so every now and then. Do you think I should get her a bigger cage? or is the small one o.k for now? I think I should leave it that way for now as she is getting use to climb on his cage and I don't want to change things I have already made changes that she must adapt to. But do you think I should get her a bigger cage in a few months time I want her to have more space and feel that she will never be kept close in a cage ever which I will never ever do. Is it also o.k that I give her fresh fruit now? at least she is nibbling on it and it is a good sign that she is eating other things then sunflower seeds? Yes, raw produce should be given from day one regardless of what the bird is used to eating because seeing it there will start the process of getting them used to it. And, if she is already eating fruits, you have half the diet battle already won! Cage size depends... Aviary birds require a larger cage than companion species and the small ones even bigger ones because they are flighty and need the space for it. But it also depends on how long the bird needs to be in it because, for example, if it's used only for sleeping, even a smallish one will work. But, aside from this, unless the cage is completely inadequate (super small, rusty, etc), one should always wait a bit before replacing the cage the bird is used to because having their familiar housing helps with the transition into a new home. Thank you. I am going to try 4 types of grain for breakfast tomorrow morning, will it be a good idea to add a few sunflower seeds and fruit pellets for now or can I add fresh fruit instead? I'm going to leave the cage for now as she is climbing in and out on her own and sometimes go have a nap in Kiko's cage. I do make sure that she see Kiko coming to me and also giving him allot of attention and for sure she is turning and looking every time he comes to me so she can see I have a good bond with Kiko and want to have the same bond with her. please advise on the breakfast grain. thank you in advance.